and Play With My Food. I was so busy the last 2 months that i could not find time to update my blog. Anyway, Ching and TT, i will try to accommodate and see what i eat. It would be easier to know what i don't like than what i like as I live to eat, so to do that, have to cook and bake, not only the foods i like but foods that friends and family like especially when you are far away from Malaysia, land of all my favorites. In the previous meme, the foods mentioned are old favorites and as time passes by, tastes and choice change but not far from base. With all the travelling around the world and experiencing new cuisine, the palate is still tune to home base - rice. I love RICE, plain or flavored no matter. I would be very satiated with just plain hot rice with salt fish or salted eggs and even a piece of 'fu yee' with a tinge of sugar, lime juice and sesame oil. A different version of rice - CONGEE of all the chinese dialects and i think i like Teochew the best. SOY is another stable. My seventh heaven would be in the Land of Tofu. I love cooking with all forms of tofu and enjoy eating them. SOUPs, the asian type which is simmered for hours. I depend on the pressure cooker to do the work. The Soup of the Day for me would be 'Choy Khon'. NOODLES - Since i am a rice lover, therefore i crave for kway teow and meehoon. When i have a choice of the type of noodle, i would order meehoon for my curry, kway teow for my fish balls soup and my favorite is the Ipoh Sar Hor Fun. There is no end to what i like, so i better pass it on before i bore my friends who visit my blog. 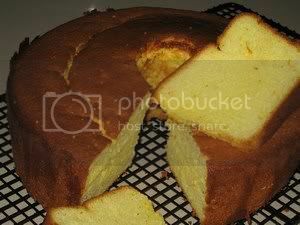 Originally, i wanted to make an orange chiffon but the orange juice was not tangy at all. So, I added lemon juice therefore have to call it Lemon Orange. Whisk egg whites,cream of tartar amd half portion of sugar in an electric mixer until just stiff and mixture holds its shape. Whisk egg yolks and sugar until light and creamy. Add grated orange and lemon rind. Add orange and lemon juice and stir well. Sift in cake flour , baking powder and salt and fold gently . Stir in corn oil. Add 1/3 of the egg white to the egg yolk mixture and combine thoroughly. Pour the rest egg white mixture into egg yolk mixture. Carefully and gently mix with a spatula until batter is even. Pour mixture into a 20cm ungreased tube pan. Bake in preheated oven for 40 minutes or until cake is well browned on the surface. Remove cake from the oven and invert mould immediately. Leave aside to cool completely before removing from the mould. To remove the cake from the mould, run a knife around the sides of the mould and the base as well. Kodok in malay means toad and i guessed the finished product is so ugly that the name is self explanatory. The only failure in making this recipe is that you might end up with burnt kuih. If this batter is baked in muffin tins then it will be called 'Banana muffins'. There is only one type of bananas that are readily available in the supermarkets here and this kuih is made only when i have overriped bananas in hand. Mix all the ingredients except the oil. Remove from oil on to cake rack to cool. Making swiss roll is so easy now that i have a dear friend, Lena who so graciously arranged a big box of cake emulsifier. I had shy away from using this as years ago when i used it, it gave an aftertaste to the cake. After discussing with the younger bakers who said that there is no aftertaste, decided to give it a try again. True it has no aftertaste. Preheat oven at 400 f.
Grease and Line a swiss roll pan 10" x 15" with greased proof paper. Whisk all the ingredients except the melted butter until double and stiff. Add in melted butter and whisk to mix. On a slightly damp kitchen towel, dust with confectioner's sugar. Overturn pan on to kitchen towel and leave to cool. When cooled, remove pan and greased proof paper. 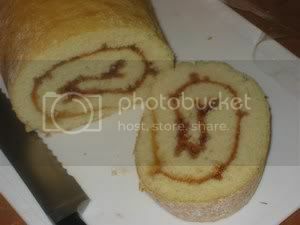 Trim edges, spread with jam and roll tightly using the towel to aid the rolling. 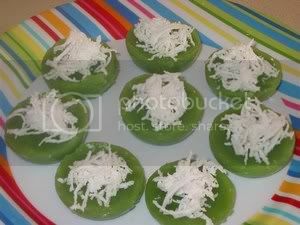 This is steamed rice cakes with grated coconut topping. For better and more interesting presentation, gula melaka or coloring can be added to the batter mixture. Mix the rice and tapioca flour in 3 fl oz/75 ml water. Stir well. Boil sugar with 15 fl oz/425 ml water until sugar dissolves. Pour the syrup gradually through a strainer into the flour mixture, stirring all the time. Add in potassium carbonate & sodium bi-carbonate solution(kan sui) and the pandan paste , mix well, add green coloring to enhanse the green. Place small chinese tea cups in a steamer over rapidly boiling water to heat for 5 minutes. 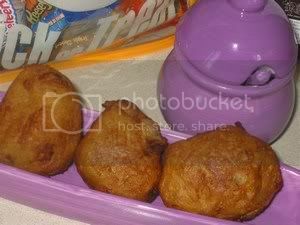 Fill cups with flour mixture and steam for 10 minutes. Remove cups and allow cakes to cool for about 20 minutes before removing with a blunt knife. Top the cake with the grated coconut. Sweetened soups are a stable with the chinese and it is served as a dessert. 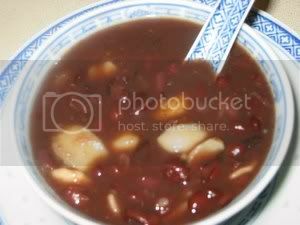 This is one of the classic which is just red beans sweetened with sugar but addition of dried longan, sago pearl, pak hup or thick coconut milk is quite common. The method of cooking over a chacoal stove until the beans are soft is the traditional way which will take hours, but a ceramic soup spoon in the soup helps the beans break up faster. Nowadays, the slow cooker or the pressure cooker does a good and fast job.The red beans from Tianjin, China is recommended. Soak the tangerine peel, when soft, remove the pith. Wash and soak red beans in cold water with the bicarbonate of soda for 2 hours. Drain. Bring enough water to cover the red beans to a boil, let red beans boil for 5 mins. Drain. In the pressure cooker, put the red beans, water and tangerine peel, cook for 1/2 hour. When pressure is released, remove lid and bring back to the boil. Add the pak hup and cook until it is soft. Add sugar and cook until sugar dissolves. Serimuka aka Kuih Sarlat has been one of the favorites of the nyonya kuihs. The egg custard layer will be green if pandan flavor is desired, otherwise it can be of a golden egg custard. 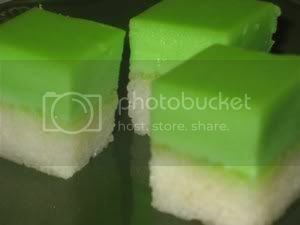 There is a requisite for nyonya kuih, the height, the color, the sweetness and richness will all determine a good kuih. 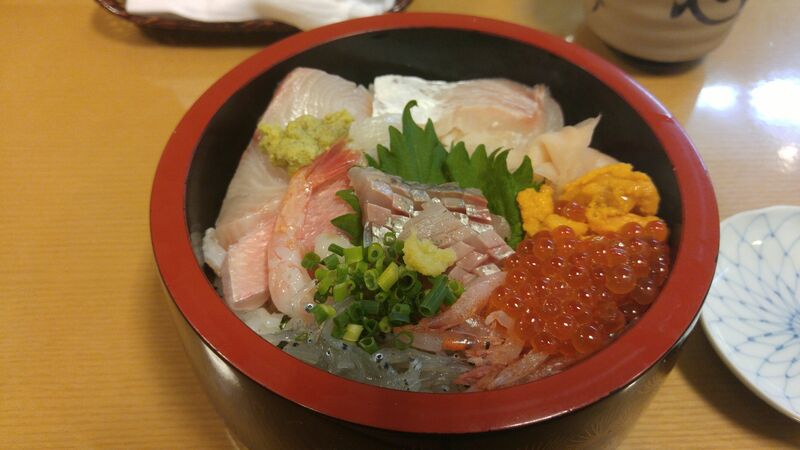 For Serimuka the rice layer has to be slightly higher and a tinge of saltiness to bring out the coconut flavor. The top layer has to be sweet enough and of a jade color. 1. Drain rice and steam on 22cm tray for 20 minutes. 2. Remove from heat, fluff up the rice and pour in the coconut milk, sugar and salt. Mix well. Steam for another 20-25 minutes or till cooked. 3. Using a spoon or spatula,press cooked glutinous rice firmly and use another tray to level pressed rice. 4. Sieve the 2 flours mixture and add them to lightly beaten eggs. Strain mixture. Add coconut milk, pandan paste, green color,salt and sugar. 5 . Cook on high in the microwave, 1 min at a time until mixture is slightly thicken. 7. Cut kueh into serving slices when cooled.